It's always in the signature…. I miss my dad’s Valentine’s Day cards. 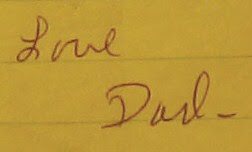 It didn’t matter what it said, I just miss his signature, “Love, Dad”. He passed away several years ago. No signature????? That’s all I remember about my dad’s cards! When looking at a piece of art, I look first at the work, and second at the signature. I may recognize the piece, but the signature let’s me know it is from the artist. I get some sense of satisfaction. I know it’s from them.